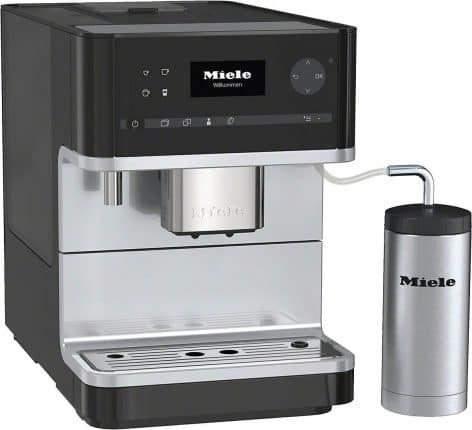 The Miele CM 6350 automatic espresso machine is significantly cheaper than the Miele CM 7500, which we recently tested. The 6350 costs more than $2,000, but it can perform as well as its pricier bigger brother. You can find the current price here on Amazon.com. 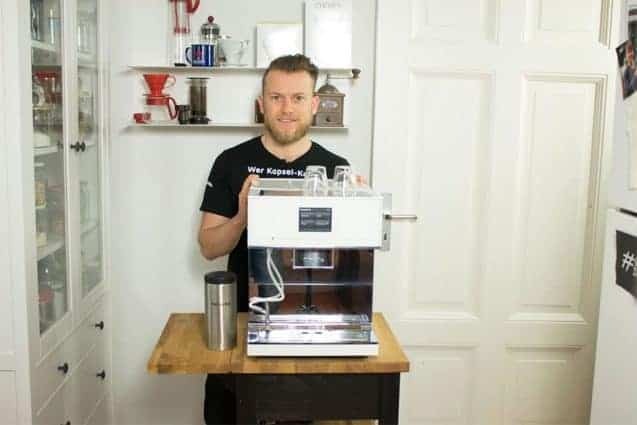 This small automatic espresso machine is also noticeably compact, but it is similar to the top models in terms of software and functionality. I got a close look at the Miele CM 6350 at the 2016 International Franchise Association Convention, a huge international trade show for appliances and electronics. Since then, I’ve been using the machine for two weeks in my own kitchen. It works very quickly, which could make it an attractive choice for large families or small offices. Rated “Very Good” on Coffeeness. 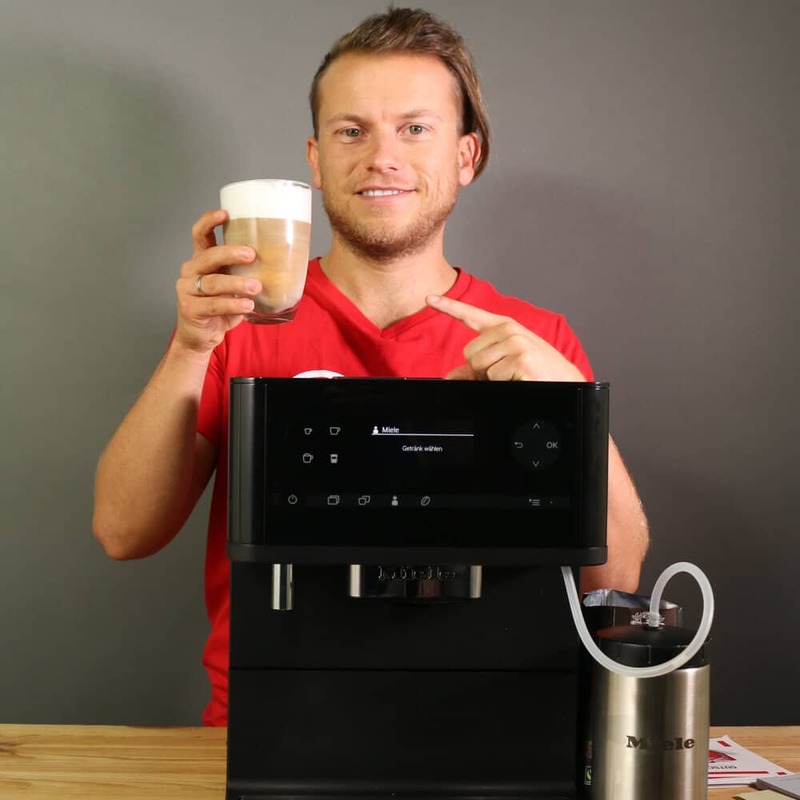 It’s easy to make an espresso, and you can get a really great caffe latte with just the push of a button. All in all, this is a quiet super-automatic espresso machine, although not quite as quiet as the Siemens EQ 9. Then again, the Siemens machine is also more expensive. Miele also put a lot of thought into how customers can – and should – clean the machine. 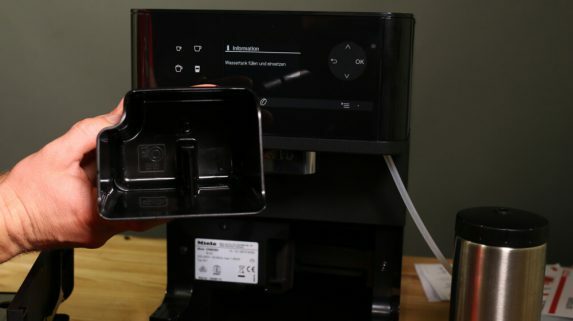 I’d say that, out of all the super-automatic espresso machines I’ve reviewed, this one is the best in terms of cleaning – or at least it’s tied for first place with the Miele CM 7500. All of its individual pieces are labeled, and it’s easy to see which parts can go into the dishwasher (fortunately, most of the parts). The brewing unit is also removable, making it easy to clean thoroughly. However, this machine doesn’t give you the option of putting a water filter inside the water tank. 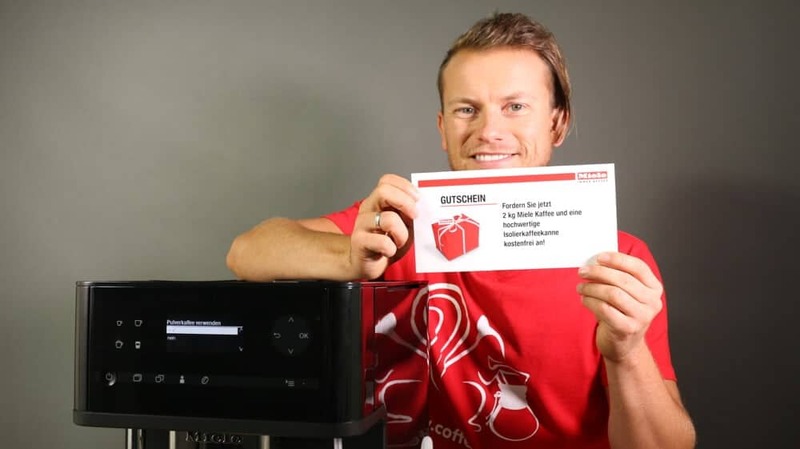 On the one hand, this means you will have fewer recurring costs, since you won’t need to buy filters. On the other hand, it means that you’ll need to decalcify the machine somewhat more frequently. The best thing about the Miele CM 6350, though, is its excellent build-quality and really beautiful design. You can order the Miele CM 6350 here on Amazon.com. Unfortunately, this video is only available in German. As is the case with all brands, Miele espresso machines come in several colors, each with different serial numbers. Miele offers two series, starting with the quite-large CM 7 models. 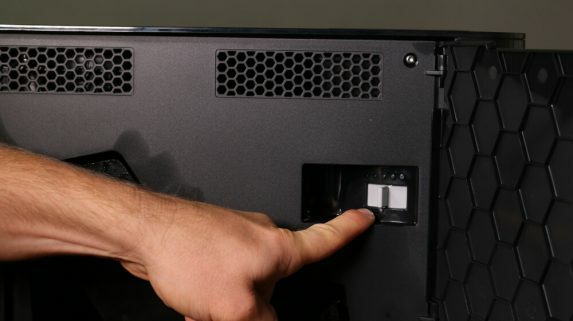 The other series is the smaller CM 6 models, including the CM 6350 in this review. 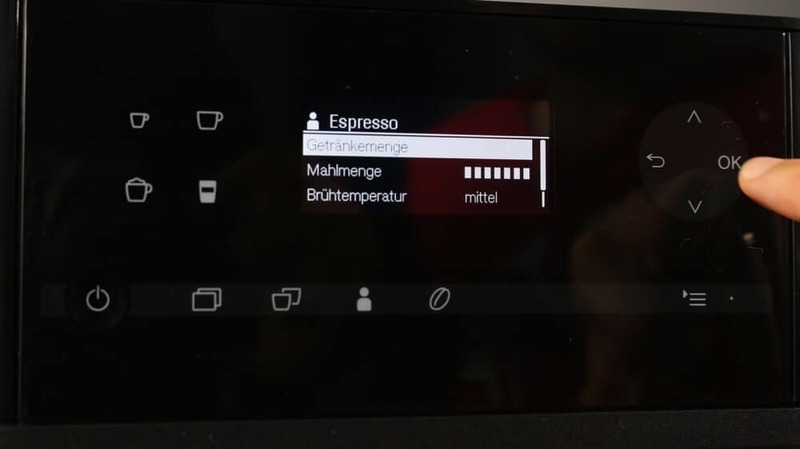 Neither of the smaller Miele CM 6 models have a touch display, and they also don’t automatically adjust to the cup’s height. They are also significantly smaller than the CM 7 series. This review is about the CM 6350 “Black Edition,” but it is physically identical to the other CM 6 models. However, the CM 6310 and 6300 are earlier models that don’t have a coffee pot setting. This has almost the same range of functions as the Miele CM 7500, except for automatic decalcification. The other main difference is that it doesn’t have a stainless-steel cup heating tray. 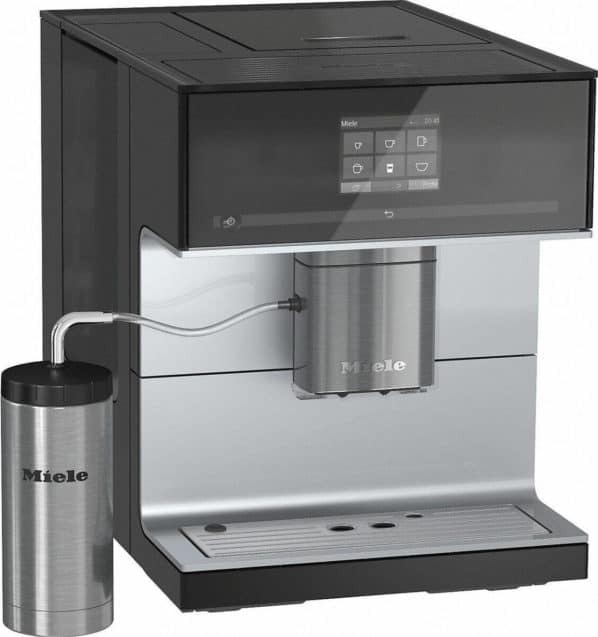 The Miele CM 7500 is Miele’s flagship countertop automatic espresso machine. It’s a beautiful – but also very large – machine, so it would work best in a big kitchen. I don’t really like most latte or espresso machines that have a white finish, but this one is simply beautiful. Just like with the other Miele CM 6 models, this one is available in several colors. For this test, we used the “Black Edition,” which is almost entirely black. Other available colors include: Obsidian Black, Lotus White and Graphite Gray. While it’s difficult to comment on colors, I like all these Miele espresso machines. You will need to decide for yourself which one looks best in your kitchen. I think the Black Edition looks pretty sleek, although I do quickly notice when dust sticks to it. Maybe it just means that I need to vacuum more often, though. You can download a PDF of the instruction manual for the Miele CM 6350 here. The manual is put together very well and is easy to understand. You don’t need to do much to set up this machine. It’s important to thoroughly wash out the water tank and the milk container before using them. Actually, you might want to rinse them out a few times, and I personally wouldn’t drink the first few beverages that come out of the new machine. That’s true for both the espresso and also for the milk. If you have some old coffee beans lying around, you may want to sacrifice them while setting up the machine. Later, once everything is good to go, then you can use better beans and enjoy the drinks. Later on in this review, we will take a closer look at the grinder settings, as well as how to measure espresso and froth the milk. For now, one important step is to set the correct water hardness so the CM 6 can correctly tell you when it needs to be decalcified. You can check your water hardness with a testing strip, or you can also contact your water company. The harder your water, the more often you’ll need to decalcify your automatic espresso machine. The display is large and clearly lit. It’s not a touch display, though, which is only available on the CM 7 models. The controls are exceptionally good, and using the machine is very intuitive. It’s always a bit difficult to describe a control menu, but I was able to understand how to use everything on the CM 6350 without needing to look at the manual. I was even pleased with the beverage selections. The available drink options are organized in a logical way. 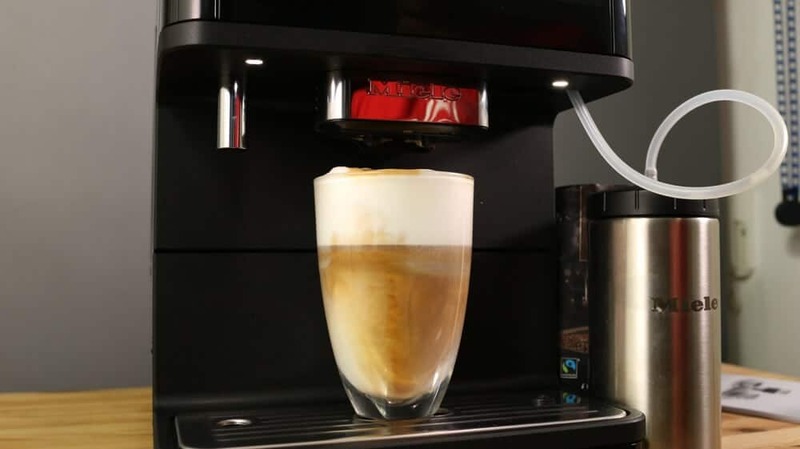 Many manufacturers of automatic espresso machines can go a bit overboard when it comes to listing the number of different drinks their machines can make. 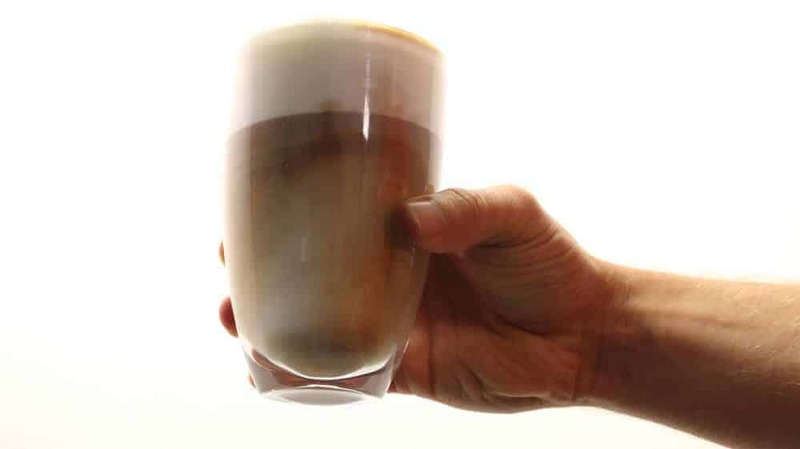 Some often claim the machines can make between 20 and 27 “specialty coffee drinks.” However, I think it’s most important that a machine can simply make good espresso and good milk foam using hot milk. 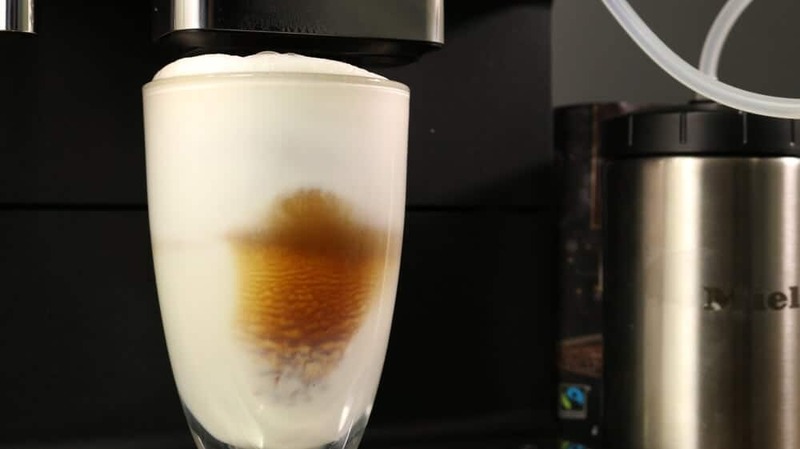 If it can do that, then you can also make other drinks, like caffe lattes or even the beloved latte macchiato. It’s like eating at a fancy restaurant: If the menu is limited, it’s actually probably a good sign. 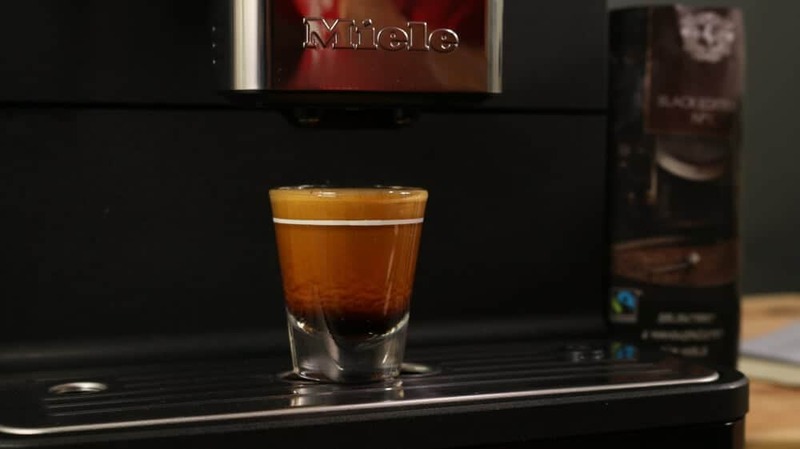 The Miele CM 6350 makes an excellent, high-quality espresso. The espresso setting works very well, and I especially liked how I could do a “pre-infusion” before brewing the espresso. With that setting, the machine adds a bit of water to the ground coffee in the brewing unit before it begins to push the water all the way through. 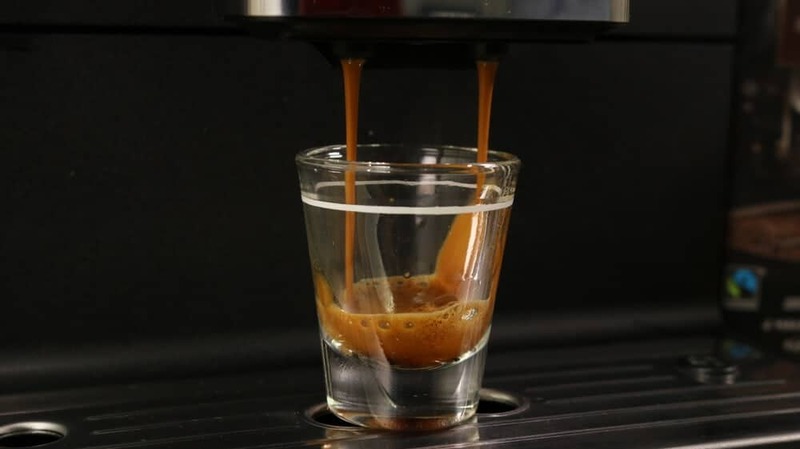 That makes for a better coffee extraction, evenly releasing the espresso’s wonderful aroma. At least that was the case when I compared it to my La Pavoni Professional manual espresso machine. The result of the “pre-infusion” was a better extraction. You will also definitely have more possibilities to optimize your drinks. You can adjust the amount of ground espresso and the resulting amount of liquid espresso that you make. What setting would you use? Those are the variables that you can adjust to change the strength of your espresso. I didn’t always change all of the variables, though – I mostly kept a “long” pre-infusion and a “fine” grind. I also left the temperature alone. Although I generally would set the machine to use more ground espresso, I noticed that the pucks of coffee grounds from Miele machines can get pretty big, so I just set the amount of ground espresso a bit lower. I used the coffee from Miele, and I’ll talk more about that in a moment. For Miele’s coffee, I used their official recommendations: pre-infusion – long; temperature – medium; grind – fourth setting from the left; amount of ground espresso – third setting from the left. The Miele 6350 really has a lot of different settings, if you want to use them. However, you can also just keep things simple, which might be best for beginners. The settings also depend on the beans you use. Which Beans Should You Use for Miele Super-Automatic Espresso Machines? Which beans to use is always a difficult decision to make. If you buy a machine that’s this good, you’ll naturally want to also use good coffee beans. You can only get something good out of it if you put something good into it. So if you don’t use good coffee beans, you won’t get good results. 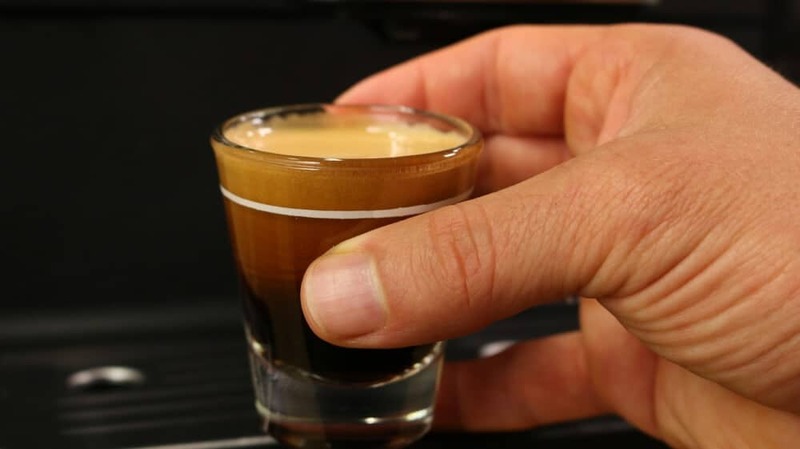 It is natural for many readers to ask what is better: coffee beans or espresso beans? I think the answer is clear: espresso beans. 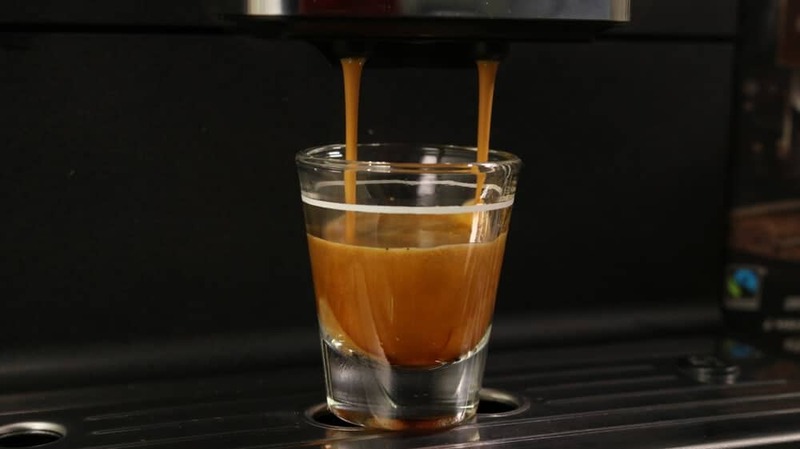 Generally speaking, a café americano made from an automatic espresso machine will taste better with espresso beans than regular coffee beans. In the manual for the Miele CM 6350, it even says that you shouldn’t use the same kind of beans for both espressos and other coffee drinks. I think that may be out of date, though, since Miele now offers its Black Edition No. 1 beans — but the package doesn’t actually indicate whether it contains espresso or coffee beans. Based on the beans and their roast color, though, it’s pretty clear to me that they are espresso beans. These are 100 percent Arabica beans from Central and South America (Brazil, Colombia, Nicaragua and Honduras), with the whole certification fun pack: organic and fair trade. The information sheet says “Miele Quality Premium Coffee Blend.” That’s definitely espresso in my book, and, additionally, the name “Black Edition” itself should tip us off. 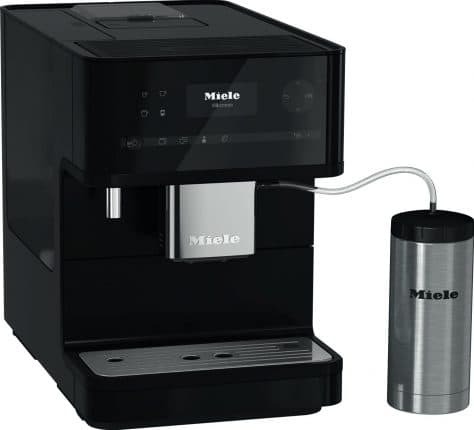 The Miele 7500 also included a package of Illy Espresso, but I didn’t care much for it and I wouldn’t recommend it. The Black Edition No. 1 is better. It represents the leap from a mass-produced coffee or espresso to a hand-roasted coffee from a drum roaster, which results in a much fuller aroma and better crema. 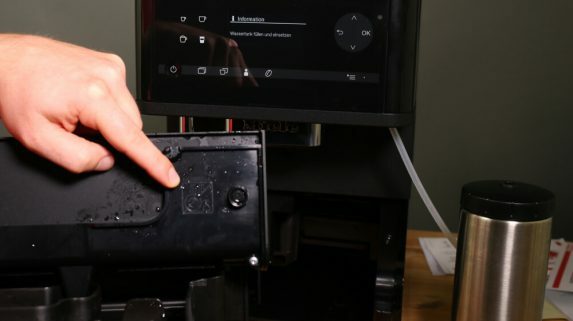 By the way, if you order the CM 6350 “Black Edition,” you will also receive two kilos (about 4.4 pounds) of the Black Edition Espresso, as well as a coffee pot. Of course, I also tested the pot right away. On the box, it says the beans are “ideal for making espresso, coffee and specialty coffee drinks with milk.” I was quite pleased with the espressos and caffe lattes that I made with the Black Edition No. 1 beans. They were rather smoky and a tad bitter. The milk components on the Miele CM 6350 work quickly and well. It’s also a really easy system to clean thoroughly. When the milk first starts coming out of the machine, it really lets it rip – “WOW!” I thought. “Look at it go!” Then the automatic milk frothing system kicked in and started efficiently doing its thing. It’s also already set at the optimal temperature, and the milk’s consistency and taste won over everyone in our office. For years now, I’ve been schlepping new automatic espresso machines in and out of our office every week, and my four co-workers have been game to help out with the testing and sampling. They were noticeably more excited about this machine than most of the others. They even liked the Black Edition No. 1 beans. 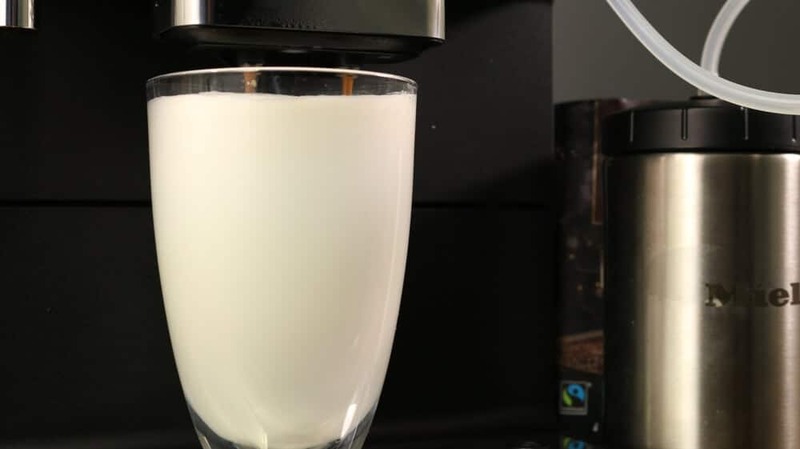 The fact that the machine can quickly dispense and froth the milk is likely also useful for people who are short on time or who work in small offices. It’s definitely cool that you can quickly make two double servings of cappuccinos. In other words, I give two thumbs up for the milk frothing system. Under the lid, on the right side of the CM 6, you will find the control to adjust the grinder. It has five different settings. If you are adjusting it to a finer grind, you should only move it a little at a time so the grinder doesn’t jam. This means that you should only move it one step finer (to the left) at a time, and then try it out by making an espresso. If the results aren’t what you want, then you can try the next level. Keep in mind that you’ll only really see the results of the new setting after making one or two espressos, as it takes a couple cycles for all of the newly ground coffee to move through the machine. Every time you open the lid, you should also empty the water tank. The software in the machine will then reset the level to ‘0,’ which is good — you don’t want it to overflow. Then set the grinder to the next finest level. 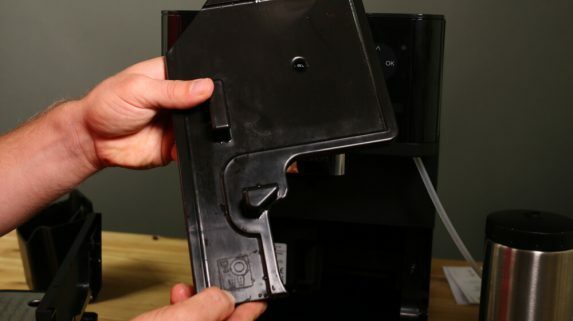 These compartments for pre-ground coffee are becoming standard on almost all super-automatic espresso machines. 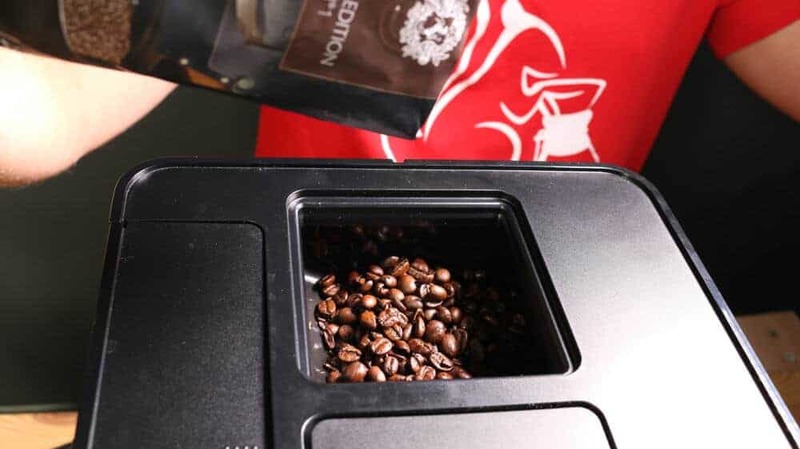 These compartments basically bypass the grinder, letting you use coffee that has been previously ground. I advise against using them, though, regardless of the machine or the manufacturer. These compartments are always more hassle than they are worth, which is the reason I don’t even test them anymore. First of all, coffee grounds always manage to stick to the compartment walls because of the machine’s high humidity. What’s more, the coffee is often ground too fine or too coarse, which means that it doesn’t work well in the machine. It’s very unlikely that I’d use the compartment for ground coffee on the Miele CM 6350, just like with all other espresso machines. After all, the best thing about an automatic espresso machine is that it freshly grinds the beans every time you use it. In my coffee bean reviews, I also always advise against buying pre-ground coffee. Using freshly ground whole beans is the secret to unlocking coffee’s wonderful aroma. This machine lets you program different personal profiles for different users. You can also include a name with each profile, which is something that you can’t do with all machines. Machines from other brands only let you include a number for each profile. So, naturally, I set up my own “Arne” profile. The machine used my profile to save all my preferences for the different drinks I made. You can also include additional profiles with different names, of course. Using your profile, your can make a “personalized” espresso, ristretto, cappuccino or whatever other drink you want. You can also search for your settings by using your name. Everything works very well, although that’s not out of the ordinary for an espresso machine in this price range. Miele did a good job of providing a simple, well-designed cleaning process for the CM 6350, which helps explain its great test results. When testing the Miele CM 7500, I liked how the individual components were clearly labeled. Each piece indicates whether or not you can wash it in the dishwasher. 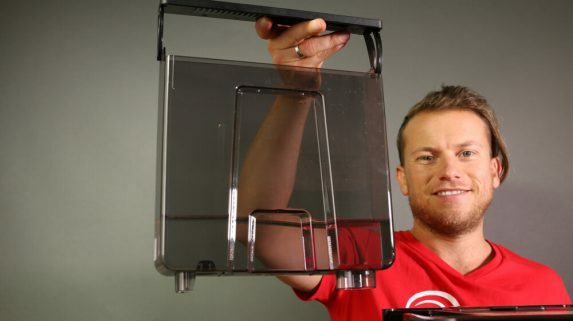 Most parts can go in the dishwasher, which is very practical, of course. It’s easy to take everything apart and put it back together. In terms of cleaning, Miele is ahead of its competitors. A removable brewing unit has become a standard feature on machines from all brands, with the exception of Krups and Jura. I think this is a very important feature. The removable brewing unit makes it even easier to thoroughly clean the Miele CM 6350. I recommend taking out the brewing unit and cleaning it every day that you use the machine. The manual says that you should clean the brewing unit “weekly.” Personally, I’d wash it out every day under running water. The fussier you are about cleaning the brewing unit, the longer your espresso machine will keep on trucking. While you’re at it, I also suggest cleaning out the grounds container, the drip tray, the drip tray cover and the milk container. When using the milk container, be sure not to simply add more milk when it gets low. Instead, every time it empties, wash it out and then fill it with fresh milk. Otherwise, some of the older milk will stay in the container, and the milk will go bad sooner. Even the milk nozzle can be taken apart easily. If it becomes clogged, just soak it in warm water. You can’t mount a water filter in the Miele CM 6350’s water tank, so it’s especially important to set the correct water hardness in the machine’s controls. 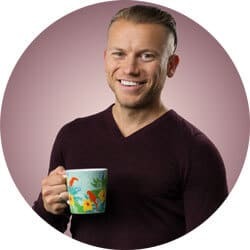 By not using a water filter, you will probably save about $15, but you will have to decalcify the espresso machine more often. That’s the cheaper option, but you’ll have to deal with the decalcifying solution in the machine. Otherwise, you can also buy softened water or use an external filter. For example, you could use a classic Brita water pitcher to filter your water before pouring it into the water tank on the CM 6. It’s really great when something works automatically. While I’m usually a bit skeptical about some automatic features, the setting to clean out the hose on the Miele CM 6350 is actually really good. To clean the hose, stick it in the drip tray. Then choose “Clean Hose” in the menu, and the machine will blow hot steam through the hose. This works even better than cleaning it by hand. The coffee nozzle is also self-cleaning. It cleans automatically when you turn off the machine, and also when you turn it on. I know that many readers don’t like that, but I personally think it’s excellent. It’s great when the machine cleans itself because, otherwise, many of us would simply forget to do it ourselves. The high-quality milk container is made of stainless steel. It has good insulation but can also be stored in a refrigerator. Or, if you’d prefer, you can also simply stick the milk hose into a milk carton. The advantage of doing this is that you can just toss the carton when it’s empty. Most users seem to do exactly that after using the machine for a while, and it’s also become the norm in our office. As noted before, almost all the compartments and components can go in the dishwasher. However, I’d generally avoid doing that and, instead, simply wash them out with running water. That is completely fine. Also, you should be careful to avoid getting coffee residue in your dishwasher, which is always a pain to get out. Unfortunately, it is easy to forget to clean the water tank. Every time you fill it up with fresh water, be sure to rinse it out first. I’d also suggest that, once a month, you should let it dry out completely and then wipe out the inside with a clean cloth. However, I’d definitely not use any dish soap to clean it out. The automatic cleaning program works well, but you should still definitely follow the cleaning steps outlined above for the Miele CM 6350. Also, be sure not to ignore the notification if the machine says it needs decalcifying. This program is the only way to clean the inside of the brewing unit. Of course, it’s also important to clean the brewing unit on the outside, but that’s an extra step, not a substitute for cleaning the inside. To use the cleaning program, you’ll need cleaning tablets and decalcifying tablets. There are original Miele cleaning tablets on Amazon, but you can also use cheaper substitutes. 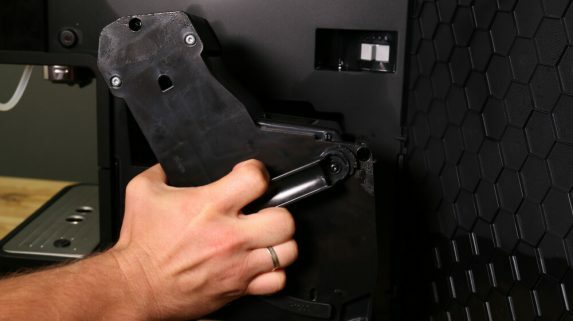 This is an especially important “Bonus Tip.” If you’re going away for a while – such as on a vacation – you should clean out the machine with the cleaning tablets. Obviously, you’ll also want to empty and clean the milk container. I’d also empty the water tank and store it when it’s dry. I’d then take out the brewing unit, clean it and leave it outside the machine. Leave the lid open. Finally, don’t forget about the drip tray or the grounds tray. If you follow these steps, you’ll return from your vacation to find a clean, mold-free espresso machine waiting for you. I very rarely give full points to any of the machines that I test, but I believe the Miele CM 6350 (Black Edition) warrants it. With its size, it can fit comfortably into any kitchen, and it’s very impressively made. All of the experiences I had with the machine were good. Even the way that the other people in my office reacted was a clear sign that the design was striking. Of course, the rating is also based on the machine’s good functionality. When comparing the price of this machine to the significantly larger Miele CM 7500, the Miele CM 6350 is a clear winner. It costs half as much and therefore has a better balance between price and performance. The Black Edition also includes the voucher for two kilograms of Black Edition No. 1 Espresso. With the voucher, you’ll also receive a free thermos coffee pot to use with the coffee pot setting. I’ve also read many other reports and reviews of the CM 6 series, and the buyers all seem to have good things to say. The Miele CM 6350 is the current model, a follow-up to the Miele CM 6310. The Black Edition is especially interesting, as it includes the free coffee pot and espresso. Other than the color, though, this model is identical to the other CM 6350 models, which you can likely get for a bit cheaper. It might just depend on how much the insulated coffee pot is worth to you. Finally, even the machine’s other components, such as the stainless-steel milk container, are well-made and leave a good impression. I also really like the many ways that you can adjust the machine’s settings. The quality of the espresso is very good, and the foamed milk is also good and only takes a short time to make. The pre-infusion setting is also a great way to further optimize your coffee drink. I can definitely recommend this machine. You can order the Miele CM 6350 here on Amazon.com. Great video and so very informative! Just got my 6350 machine & having trouble with the portion amount of coffee fluid as it only delivers 4oz for each drink selection? Can’t seem to change that function. Guess I’m just stupid! Ugh! Need a video show how to with step by step in the ‘parameters’ in order to change the selection of portions amount, etc?